“I’m just having a good day today.” Those were the words of Lakers guard Nick Young after last Friday’s win against the Warriors. Young did have a pretty good performance in the win — he dropped 21 points and is averaging 13 in what has been a surprisingly good season so far for the man nicknamed Swaggy P.
But the best part of Young’s day on Friday wasn’t his performance, and it wasn’t even the win. It was the way he impressed the young lady sitting courtside. None other than Rihanna was so amazed by his performance that, according to Young, she was calling his name throughout the game. Not bad, Swaggy P, not bad. Nick Young is certainly the envy of thousands of men worldwide. Not only does he get shoutouts from Rihanna during games, take a look at Iggy Azalea, the girl he’s dating. Yep, Nick Young is living the life. External, unseen forces aren’t usually at work during NBA basketball games, but the Golden State Warriors appear to have become the exception to that. The days of Sleepy Floyd putting up 50 points against Magic Johnson and the Lakers are far behind us. The RUN TMC era that Tim Hardaway, Mitch Richmond, and Chris Mullen created is pretty far removed from us as well. Even the Warriors' last magical run in the playoffs when they beat top-seeded Dallas Mavericks as an eighth seeded team happened in 2007. Though your memory might tell you otherwise, that series was actually seven years ago. But the Warriors are back, and it looks like they brought some of that playoff magic with them. And as crazy as it seems for assuming the Warriors have some sort of playoff aura around them, it’s kind of hard to argue with the way history looks. Don’t get me wrong, Stephen Curry is on an incredible streak and may be cementing himself as one of the best players in the league, and at the very least, he’s proven he is the best shooter in the game of basketball. But, I don’t want to be the one to deny that some sort of playoff magic is helping the Warriors. And this has been going on for years. This isn’t simply an acknowledgement of a few major events in playoff history. The Warriors only title was in 1975 when a Rick Barry-led squad swept the Washington Bullets. What shouldn’t come as a surprise to you, however, is that the '75 Warriors were considered heavily as the underdogs. Many people in the basketball world actually believe the '75 Warriors performed the biggest upset in NBA history. This isn’t a new occurrence, this is just who the Golden State Warriors are. And that brings us back to this team. The Stephen Curry led Warriors are one home game away from advancing to the second round and they’ve already made sure to leave a few lasting memories. Stephen Curry did his best impersonation of Davidson Stephen Curry and threw in 22 points in the third quarter of game four against the Nuggets. And in game five the Warriors almost came back from a 27 point deficit. The way history has shaped already, it’s looking fairly grim for the Denver Nuggets to make it out of the first round. With a notably weaker team after the loss of Danilo Gallinari as well, the stage looks perfectly set for the Golden State Warriors to add another chapter to their compilation of playoff stories. Before NBA fans get to see the matchup we’ve all been waiting for (Usain Bolt vs. Kevin Hart in the NBA Celebrity Game), and before fans get to see the least amount of defense ever played in a basketball game (excluding Harlem Globetrotters contests), the midway point of the NBA season, otherwise known as NBA All-Star Weekend, seems to be the perfect opportunity highlight a bit of what has gone on thus far in the 2013 season. So, to honor All-Star Weekend and the lightheartedness basketball fans will enjoy because of it, here is the good, the bad, and the ugly from the midway point of the NBA season. The San Antonio Spurs are one of the oldest, if not the oldest, teams in any of the four major sports. For a few years now the Spurs have seemed to be teetering on the fence between contender and has been. Even though they’ve had some close calls, almost falling in to has-been territory, Gregg Poppovich has once again rallied his group of gritty veterans, and the San Antonio Spurs currently stand at the top of the Western Conference, with the best record in the NBA. Tim Duncan is having one of his most efficient seasons in years, and the continual emergence of 3rd year-player Kawhi Leonard has given the Spurs enough athleticism to stay relevant with the rest of the league. For the past few seasons NBA “experts” have asked each other if the Spurs are too old, or if they’re athletic enough. And for the past few seasons the Spurs have continued their excellence and proved the experts wrong. Father Time is an unbeatable opponent for everyone, but at the midpoint of the NBA season it appears as if the Spurs have temporarily defeated him. Again. Where does one even begin with the Lakers? Steve Nash, Dwight Howard, and Pau Gasol have all missed significant time with injuries. A spark off the bench, Jordan Hill, is out for the season (though his injury allowed for the emergence of Earl Clark), and the Lakers have even gone through a coaching change. Basically anything that could go wrong in LA has. Now rumors are circulating that Pau Gasol may ask for a trade at the end of the season, Dwight Howard may walk as a free agent, and stories of Nash and Howard feuding have emerged. The Lakers are on outside looking in on the playoff picture, and it actually isn’t completely far-fetched to say they won’t make the playoffs. After the most exciting offseason the Lakers have had since acquiring Shaq, not even the most avid of Laker haters would have predicted the free fall the Lakers have taken this year. Maybe they’ll make a rally in the second half of the season; it does seem inevitable with a team with so much talent, but as of now the Lakers are the clear-cut “ugly” of the midway point. Not even Dwight Howard’s blue headband, which doesn’t match any uniform he wears it with, can argue. Aside from Stephen Curry being snubbed from this year’s All-Star game, the Golden State Warriors have had a fairly positive season. That was until they released these jerseys a few days ago on Feb. 11. The NBA hasn’t been particularly shy about alternative uniforms. From Christmas Day gear, to the Bulls wearing green jerseys on St. Patrick’s Day, odd NBA jerseys have not been in short supply. 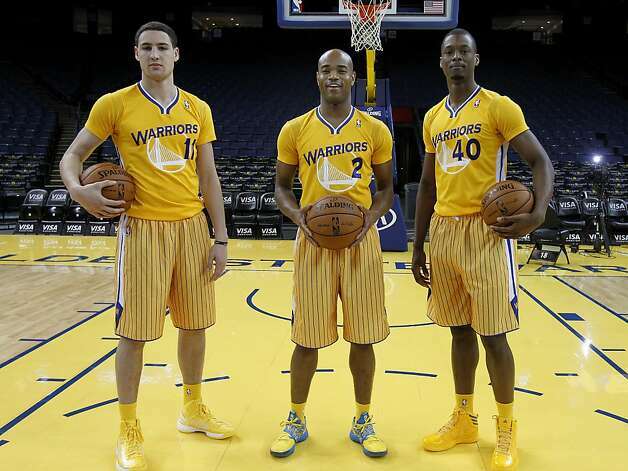 But this new Warriors get up isn’t exactly top of the line fashion. The Warriors will be the first NBA team to adopt sleeves on their uniforms (while a few college teams are as well). The first problem lies with the color scheme being a bit off, (it doesn’t really make sense why the shorts would look like an entirely different uniform than the top), and that’s just the beginning. The uniforms don’t exactly look like basketball jerseys. They probably resemble Olympic men’s volleyball jerseys, and they won’t exactly be the most flattering jersey for most players in the league. It might look cool on athletic swingmen like the ones the Warriors had for the picture, but many players in the league just shouldn’t be wearing what is essentially a form fitting t-shirt. And besides the terrible color scheme, sleeves just aren’t a part of basketball culture. There’s a certain jersey look that embodies basketball, and what the Warriors have isn’t it. On a positive note: we’re provided with a new jersey to use in NBA2K13. As the NBA season approaches the All-Star break, the undefined half-way marker, we take a look at two teams in each conference that have been playing extremely well since the beginning of the season and could make some noise in the play-offs if all of the correct piece fall into place. With Derrick Rose sidelined late last year with an ACL injury, the Chicago Bulls were all but counted out of the elite teams in the Eastern conference. Analysts buzzed about the defending champions Miami Heat, the Brooklyn Nets, their cross-city counter-parts New York Knicks, the aged Boston Celtics, and, to a lesser degree, the Indiana Pacers. No Rose, no hope. But boy were they wrong. The Bulls are currently 3rd in the Eastern Conference behind the Miami Heat and New York Knicks, beating out three teams projected to do better than them this season. They have won seven of their last ten games, have the best road record in the NBA at 12-6, and have rallied behind the principle of team unity the entire season. Joakim Noah, who is averaging 12.1 points, 11.3 rebounds, and 4.2 assists to go along with 2.2 blocks and 1.3 steals per contest, has been the heart and soul that anchors a team of gritty, tireless players that hustle every minute of the game and never give up. Luol Deng has stepped up offensively to provide the primary scoring threat for the team. Carlos Boozer has played resurgently as of late, showing shades of his old self with a string of monster games earlier this month. Coach Tom Thibodeau has instilled a terrific mentality in this group of players who have really rallied together to play hard night-in and night-out. If the Bulls continue to play with the tenacity they’ve shown thus far when Derrick Rose returns to the line-up after the All-Star break they would look similar to the scary #1 seeded Bulls team of two years ago and could spell trouble for first and possibly second-round opponents. Stephen Curry, Klay Thompson, Harrison Barnes, David Lee, and Andrew Bogut. That’s the line-up that Golden State Warriors’ fans envisioned would carry them to the play-offs this year, and it is a scary one to imagine for opposing teams. But after playing just four games in the season, Bogut went down with an ankle injury, causing him to miss the next 38 games. The Warriors did not let Bogut’s injury hamper their whole season, though. Currently sitting at the No. 5 seed in the West, they are young, athletic, and fun-to-watch. Not only that – they get the job done. They boast an impressive 14-6 home record, and despite going 5-5 in their past ten games played, they have played well throughout the season. Curry is having an all-star caliber year (21 points, 6.4 assists, and 3.9 rebounds per game) and proves to be the glue that holds the team together. Last year fans got a glimpse of what Klay Thompson could be after the shooting guard spot opened up in the post-Monta Ellis era. He averaged over 20 points a game on 45% shooting last year after Ellis was dealt to the Bucks. Thompson started the year slowly shooting below 40% and not performing, but has since come into form and is shooting the ball well. Harrison Barnes also started the season rocky, and although his numbers aren’t spectacular, the Warriors are better as a unit when he is on the court. He is a terrific defender and does a lot of the dirty work and intangibles that do not go on the stat sheet. Supplement these young shooters with big men like David Lee and Andrew Bogut who are not afraid to get physical and bruise their way to rebounds and inside paint points and there is a legitimate inside-outside threat that teams will have to deal with. Head coach Mark Jackson has given these young players immense confidence to play the game their style and it has been working thus far (27-17). It may take a while for the chemistry to settle in with Bogut back in the line-up, but if they continue to play well the Warriors can hover around the 4th-6th seed in the West – and don’t be surprised if they pull off an upset or two in the playoffs.